Los medios al gobierno, el software al poder (leyendo a Manovich) (I). Como los lectores de Hipermediaciones habrán detectado me entusiasmó mucho el libro Software Takes Command de Lev Manovich. En mi doble reseña de La Semiosis Social 2 de Eliseo Verón (ver primera y segunda parte) hice mención a este texto que, sin dudas, generará nuevas conversaciones y debates en el ámbito de las teorías de los medios. ¿Por qué? 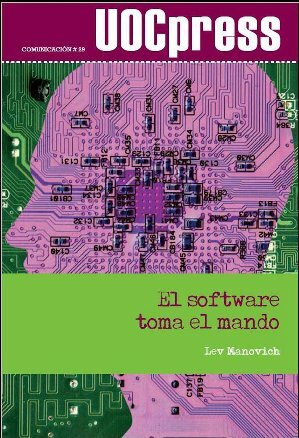 Porque el libro de Manovich propone una innovadora teoría de los medios software-centred. Como en otras ocasiones resumiré brevemente el contenido del libro y, al mismo tiempo, dejaré caer algunos comentarios y reflexiones. ¿Por qué una teoría de los medios debería centrarse en el software? Because outside of certain cultural areas such as crafts and fine art, software has replaced a diverse array of physical, mechanical, and electronic technologies used before the twenty-first century to create, store, distribute and access cultural artifacts … Software has become our interface to the world, to others, to our memory and our imagination —a universal language through which the world speaks, and a universal engine on which the world runs. What electricity and the combustion engine were to the early twentieth century, software is to the early twenty-first century (p. 2). A partir de esta idea Manovich propone el concepto de “media software” para definir a los programas que utilizamos cotidianamente, desde Photoshop hasta Word o Google. Yo creo que Marshall McLuhan, quien manejaba una concepción bastante amplia de “medio”, le hubiera puesto un ME GUSTA a esta definición. Even today … when people are constantly interacting with and updating dozens of apps on their mobile phones and other computer devices, software as a theoretical category is still invisible to most academics, artists, and cultural professionals interested in IT and its cultural and social effects (p. 9). I think of software as a layer that permeates all areas of contemporary societies. Therefore, if we want to understand contemporary techniques of control, communication, representation, simulation, analysis, decision-making, memory, vision, writing, and interaction , our analysis cannot be complete until we consider this software layer (p. 15). The use of software re-configures most basic social and cultural practices and makes us rethink the concepts and theories we developed to describe them. As one example of this, consider the modern “atom” of cultural creation, transmission, and memory: a “document,” i.e. some content stored in a physical form, that is delivered to consumers via physical copies (books, films, audio record), or electronic transmission (television). In software culture, we no longer have “documents,” “works,” “messages” or “recordings” in twentieth-century terms. Instead of fixed documents that could be analyzed by examining their structure and content (a typical move of the twentieth-century cultural analysis and theory, from Russian Formalism to Literary Darwinism), we now interact with dynamic “software performances.” (p. 33). Hasta aquí los fundamentos de la interpretación que Manovich nos propone. Como pueden ver, hay mucha tela para cortar. Kay conceived of “personal dynamic media” as a fundamentally new kind of media with a number of historically unprecedented properties such as the ability to hold all the user’s information, simulate all types of media within a single machine, and “involve the learner in a two-way conversation. (p. 61). Kay and his collaborators also developed a new type of programming language that, at least in theory, would allow the users to quickly invent new types of media using the set of general tools already provided for them. All these tools and simulations of already existing media were given a unified user interface designed to activate multiple mentalities and ways of learning—kinesthetic, iconic, and symbolic (p. 61). ... practically all of computer science research which deals with media—web technologies, media computing, hypermedia, human-computer interfaces, computer graphics, and so on—is oriented towards “mainstream” media usage. In other words, either computer scientists are trying to make more efficient the technologies already used in media industries (video games, web search engines, film production, etc.) or they are inventing new technologies that are likely to be used by these industries in the future. The invention of new mediums for its own sake is not something which anybody is likely to pursue, or get funded … If we look at contemporary media software—CAD, computer drawing and painting, image editing, word processors—we will see that most of their fundamental principles were already developed by the generation of Sutherland and Kay (p. 84-93). El concepto de simulación -una categoría fundamental para comprender la dinámica de la ecología de los medios- ocupa un lugar privilegiado en la reflexión de Manovich. Los media software se caracterizan precisamente por tomar prestados elementos de otros medios (como un teclado) y simularlos en un torno digital; al mismo tiempo que lo simula el nuevo metamedium extiende las capacidades del viejo medio. 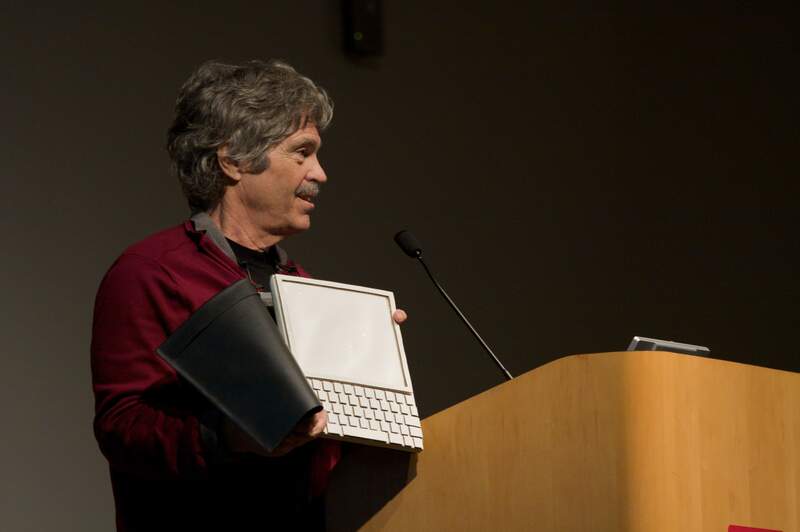 Un ejemplo: el teclado digital que aparece en la pantalla de un iPad ofrece una serie de instrumentos para formatear el texto que superan ampliamente al teclado de las viejas máquinas de escribir. Approached from the point of view of media history, the computer metamedium contains two different types of media. The first type is simulations of prior physical media extended with new properties , such as “electronic paper.” The second type is a number of new computational media that have no physical precedents (p. 110). Within the computer metamedium, all previously existing and newly invented mediums share some common properties—i.e. they rely on a set of common software techniques for data management, authoring, and communication (p. 123). … many of the “new” techniques for media creation, editing, and analysis implemented in software applications were not developed specifically to work with media data. Rather, they were created for signal and information processing in general—and then were either directly carried over to, or adapted to work with media (p. 132). Rather than operating on sounds, images, video, or texts directly,electronic and digital devices operate on the continuous electronic signals or discrete numerical data. This allows for the definition of various operations that work on any signal or any set of numbers — regardless of what this signal or numbers may represent (images, video, student records, financial data, etc.) (p. 133). This multiplicity of operations offered in contemporary application software creates a challenge for Software Studies. If we are to understand how software applications participate in shaping our worlds and our imaginations (what people imagine they can do with software), we need some way of sorting all these operations into fewer categories so we can start building a theory of application software (p. 125). Since we now understand that “media” today is really a set of software techniques constantly in development, this gives a new meaning to this troubled term. Just as there is no logical limit to the number of algorithms which can be invented, people can always develop new software techniques for working with media. So from this perspective, the term “new media” captures well this fundamental logic of “the computer metamedium.” Software-based media will always be “new” as long as new techniques continue to be invented and added to those that already exist. And while not every one of these techniques will change significantly how particular media or a combination of media will function, many will (p. 156). 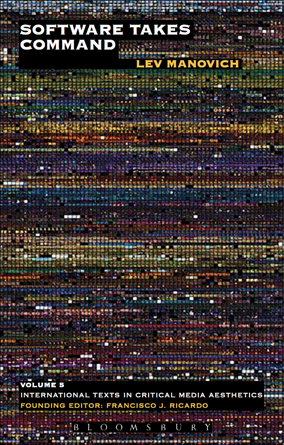 Si en The Language of New Media Manovich entraba en el mundo de los medios digitales a partir del lenguaje cinematográfico, en esta nueva obra el hilo conductor es el software. Este recorrido abre interesantes posibilidades, sobre todo por los posibles conflictos que surgirán con las teorías de los medios basadas en el contenido (por ej. la semiótica de los medios) o los soportes tecnológicos (por ej. la historia “materialista” de los medios). Manovich propone un polémico recorrido evolutivo basado en algo tan inmaterial e invisible como los algoritmos que regulan el funcionamiento del metamedium. Pero además de posibles conflictos el diálogo con los planteos de Manovich puede servir para refrescar otros ámbitos de las teorías de la comunicación donde, en muchos casos, se sigue viendo a los new media con los modelos teóricos de los old media. La primera parte de Software Takes Command reseñada en este post puede ser leída como una profundización de los argumentos de mi tesis doctoral sobre las interfaces (en gran parte publicada en mi libro Hacer Clic. Hacia una sociosemiótica de las interacciones digitales del 2004). Muchos de los planteos de Manovich se merecen una relectura en clave semiótica. Sus taxonomías de las técnicas, por ejemplo, se encuadrarían dentro de las que he denominado gramáticas de interacción -entendidas como una serie de principios y secuencias de operaciones en los entornos digitales interactivos-. Basta cambiar la palabra “secuencias de operaciones” por “algoritmos” y el puente entre ambas reflexiones comienza a tomar forma. Por otro lado libro de Manovich, en tanto propone una teoría del nuevo metamedium, también dialoga a distancia con Hipermediaciones. Elementos para una teoría de la comunicación digital interactiva (2008). La primera parte de Software Takes Command evidencia que los media software no son un medio más dentro de la serie cine-radio-televisión: estamos en presencia de un entorno radicalmente nuevo y profundamente disruptivo de las prácticas sociales. Sin despreciar los viejos enfoques teóricos la emergencia de estas prácticas de comunicación mediadas por las tecnologías digitales nos obliga a crear nuevos conceptos y categorías analíticas. Algo que Manovich hace de manera incansable a lo largo de su libro. Finalmente, la visión evolutiva de los medios que propone Manovich se vincula de manera directa con mis últimas investigaciones (ver mi artículo Media Evolution: Emergence, Dominance, Survival and Extinction in the Media Ecology publicado a principios de este año). Sin embargo esa visión alcanza su máximo desarrollo en la segunda parte de Software Takes Command. Como pueden ver, el libro de Lev Manovich contiene varias balas de gran calibre en la recámara. Esto no se acaba aquí. Nota: esta reseña se realizó a partir de la edición en inglés. Por fortuna la UOC Press (Barcelona) ya se encargó de traducirlo en tiempo record. El software toma el mando (UOC Press). Lev Manovich: Software takes command, Introducción: estudios del software para principiantes, traducción de Sophie Alamo y Adrián Yalj para la Cátedra de Datos. Los medios al gobierno, el software al poder (leyendo a Manovich) (II). Breaking Bad. Poco transmedia pero mucho, muchísimo storytelling. Desde el “Lenguaje de los nuevos medios” se venía gestando este cúmulo ideas que ahora plantea Manovich en “El software toma el mando”. Afortunadamente existen investigadores que están tratando de explicar la realidad que hoy no solo gobierna al espacio tecno-comunicativo. Lo digital es una noción que está perfectamente explicada desde su perspectiva técnica, sin embargo, ha sido complicado poder siquiera describir el estado de realidad que representa a nivel teórico-conceptual. El proceso de conversión análogo-digital ha significado una ruptura histórica en la manera de entender el mundo y cómo nos relacionamos con él. Por supuesto, gran parte de esa relación tiene que ver con el software, la interfaz y la pantalla como expresión “tangible” del proceso histórico que está viviendo el ser humano en un camino innegable hacia la simulación (virtualidad).